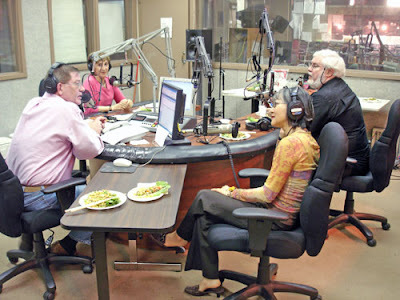 Food News & Views radio host, Linda Gassenheimer is 3rd from the right. Linda attended one of my first Wok Star class held at Bulthaup in Miami Design District when I first moved up from Key West in 1993. I met Linda many years ago in Key West at her book signing for Keys Cuisine and since my move to Miami Beach, we keep meeting up at events around town. Linda has published 7 books and does an amazing job of juggling her radio show, personal appearances and writing. I didn’t realize the extent and scope of her work until I heard her on a Slow Food Miami panel recently at the Gable Stage, Biltmore Hotel. Gosh, maybe I should start working on my book, Wok Star! 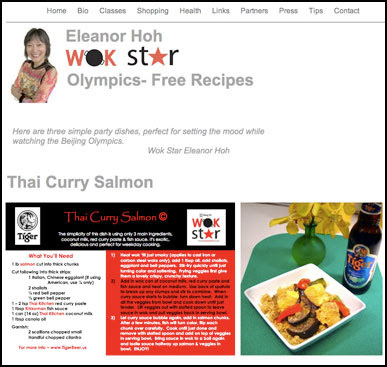 Listen to my interview with Food News and Views, host Linda Gassenheimer : Chinese cooking expert Eleanor Hoh whets our appetites for the upcoming Olympics with Chinese cooking tips and a look at fast food Chinese style. Visit Linda’s website www.DinnerInMinutes.com for more information. Pending approval, call in and you may win a Wok Star class certificate for two guests, value of $130. Visit my PRESS page to see other media appearances. You can download printable 3 FREE party dishes perfect for entertaining. Simple, easy and delicious dishes. During the interview, Linda mentioned many weird things like scorpions and insects offered on skewers in China. Well, I read in NYT’s 8.2.08 about the new $25 million, 23,000 sq. ft. Audubon Insectarium, in New Orleans showcasing termites and bugs. Especially popular with kids who have this “love, hate” relationship with squirmy, slimy insects. There’s even a wax-worm stir fry or crispy rice crickets to try! Please tell us about your visit if you go.